The annual Philanthropy Day Awards program, hosted by the Association of Fundraising Professionals Central Texas Chapter (AFP), recognizes and pays tribute to outstanding achievements by individuals, corporations, foundations and nonprofit organizations whose philanthropy creates significant impact on the quality of life in Central Texas. Awards are presented at the annual Philanthropy Day Awards Luncheon, November 15, 2018, at the Carleen Bright Arboretum Pavilion located at 1 Pavilion Way, Waco, Texas. 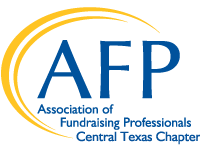 Proceeds from the event directly support AFP’s mission of advancing philanthropy by enabling people and organizations to practice effective and ethical fundraising. Nominations will be accepted through July 16, 2018. Nominations and letters of support must be submitted by mail or email. Members of the Philanthropy Day Awards Selection Panel review and score all nominations according to the criteria provided (see below). The Selection Panel may request additional nominee information to facilitate the selection process. Please inform nominee of your nomination and the date of the event prior to submitting. In order to be eligible, honorees must be available to accept the award in person on February 14, 2019. Nominations are evaluated using scoring criteria specific to each award category as listed below. For nominations to be considered complete, each scoring criteria must be addressed separately. Incomplete nominations will not be considered. The most compelling nominations address in measureable ways how the nominee has directly impacted specific organizations and causes. Please download the 2018 NPD Nomination Forms here. For more information on Philanthropy Day nominations, please contact NPD Chair, Paige Corley.